Promoting short stories and flash fiction. Mary Papas has been in love with the written word since she was a child. Books were always her best friends; sometimes her only friends. She likes to read many books simultaneously while drinking coffee and eating croissants. When she falls deeply in love with a book, she stays up all night to finish it. She views writing as a way to understand people better and communicate with them more effectively. She has written several flash fiction stories for online journals and websites. Mary is excited to contribute to this project and looks forward to helping spread the word about short stories and flash fiction! She hates her office job, her boss and her colleagues. She dreams of becoming a best selling author and secretly writes her first novel during her work hours. Talent is all she needs she thinks…but she is wrong! A single short story that will make you laugh out loud! Get The Wannabe Author for Kindle here. People wear masks. They hide who they really are. Why do they do that? What is more painful, trying to take off the mask or keep on wearing it? Five women pretend to be something they are not in this fiction anthology. Short stories about dangerous relationships. Nothing is at it seems. Get Take Off Your Mask for Kindle here. A husband and a wife drift apart. Will they make it? A washed up actress and her loyal assistant. Are they really that close, or are they using each other? Two sisters decide to talk openly about their relationship and it will change forever. For better or for worse? 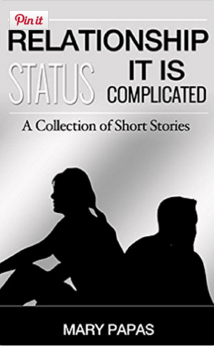 Get Relationship Status: It Is Complicated for Kindle here. This collection of 14 flash fiction stories is written by Mary Papas and Ray Tullett. There is something for everyone in these twisted tales–from humour to horror! Once you start reading you will not want to stop! These bite-sized short stories from two different authors that will keep you guessing and have you begging for more to devour. Get 14 Twisted Tales to Enthrall for Kindle here. An anthology of horror flash fiction stories all involving a murder. Murder out of habit, impulsive murder, murder framed on someone else, murder carefully planned and executed. Scare yourself with this collection of stories–and be sure to leave a light on while reading! None yet! Be the first to leave a review! Get Murder Horror Flash Fiction Stories for Kindle here. Enter your email to receive updates in your inbox. Get an SSFFS Exclusive 3 ebook bundle valued at $4.99 for only $2.99! Copyright Short Story Flash Fiction Society 2019 | Theme: Almighty by Unitedtheme.